And if you're looking for pumpkin carving stencils, check out this post from last year. Mmm, no thanks. Not that fantastic. I love the paper mache pumpkins. What a great group of links, thanks much! OMG!!! I love the fantasy pumpkins. I think I may try this! 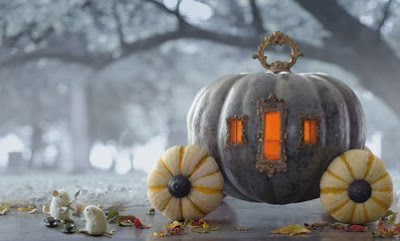 I love that pumpkin carriage! i love halloween. rather i love pumpkin carving and all the delicious and yummy decor that goes with fall. thanks for all the links. What an awesome list - thanks for compiling these! When I saw that pumpkin carriage my mouth fell open! How awesome! Thanks for sharing your list. Oh how I love halloween...this post has me totally inspired! That carriage though...it's just beautiful! I want it!!! Thank you for all the great ideas. Your site is a constant source of inspiration for me. Gosh - I love THAT pumpkin... It's so magical! I love that pumpkin coach! Thanks for sharing this. I loved the Hallmark pumpkin article. They just come out more and more fun pumpkin ideas every year. That pumpkin carriage is amazing! But where in the world do you find belt buckles like that?? And in two different sizes? In fact, is the door even a buckle? I love the cinderella carriage! Who thinks up all this awesome stuff?? Thanks for sharing. We @ Hallmark blogged you on our blog for blogging our pumpkin. THANKS! An excellent list of links which are very useful. I love this so much! What did you use for the windows and door? Nikki, looks like the Hallmark link is no longer active so we can't access the tutorial which would have answered your question. Sorry! That surely a wonderful creation! I'd love to try that. Thanks for sharing useful links. You're amazing! I pinned this to my pinterest board if you don't mind.